Best known for his starring role in England's famous 2005 Ashes victory over Australia, Steve Harmison will find himself in less elite company in his new role - as manager of Ashington in English football's ninth tier. The former pace bowler's surprise appointment was announced by his hometown team, who play in Northern League Division One, on Sunday. 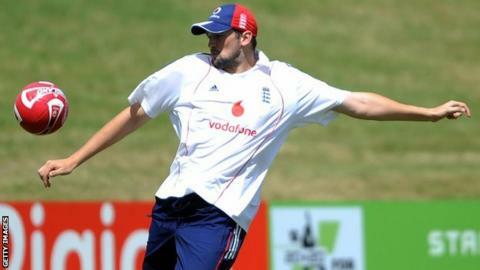 Harmison, who took 226 Test wickets for England between 2002 and 2009, played for Ashington briefly as a teenager. The former Durham player, a lifelong Newcastle United supporter, will take charge for the first time on Tuesday, when Ashington, currently 17th in the table, visit Bishop Auckland. Harmison will be assisted by head coach Ian Skinner and Lee Anderson. "All three have a wealth of experience in the sporting world and together can build on the success Ashington Football Club have had since moving to Woodhorn Lane," Ashington chairman and local MP Ian Lavery said. If the 36-year-old Harmison needs any advice in his new role, he can turn to older brother James, a former captain of Ashington, or father Jimmy, who was once assistant manager.